What in the world is a nice girl like me doing reading a book about baseball, statistics and draft choices? Well – um – Lewis is a great writer – usually about the financial sector and I enjoy reading about statistics and tech stuff. And oh yes, I rather enjoy the game – (Yankees or Twins – go figure). Lewis’ book is about the Oakland Athletics in the early 2000s and a bit prior. No, it’s not a “new” book – it was published in 2003 – but it seems to be holding up nicely. Michael Lewis is that good. It’s basically about Billy Beane’s fight for the best team in the leagues but with a lot less funding than the other teams. Beane himself was a high school draft pick, but he blew it – probably should have gone to college like his mom wanted him to. But he turned that around and got himself side-tracked to the front office, ending up as a general manager and part owner of the Oakland A’s. What was Beane’s plan? He went by the numbers rather than the good ol’ boy instincts of the scouts and other old-timers. With information available from deep statistical analysis available from professional number crunchers and computers, Beane had new ideas about how to make his underfunded team into a winner. He dissected the game, each play, into small pieces and analyzed each piece – noting the cost/benefit of each part, each player and each change. Lewis compares this to derivatives in finance. Beane went about examining his game his way – it now became a truly “team” sport from draft picks to trades and retirees, from the front office to the benches. And it worked. Beane put together a seriously winning team on a shoestring budget by carefully examining the small and sometimes unusual differences between his real choices – getting the best choice for the team. Lewis focuses on the A’s draft picks in 2002, but there’s a lot of back-story to other years and other players. There are a lot of names here – some I recognize (Daryl Strawberry and others), some I don’t (Billy Owens and many more). Lewis tells his story via a number of character sketches, each one fascinating, humorous, endearing, in its own way. 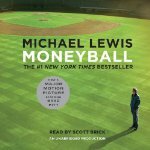 And between Lewis and Scott Brick (the narrator) the book actually becomes suspenseful what with the major successes, the disappointments and figuring out who “has it” and “who doesn’t.” The owners, managers and scouts all come alive as they charm, cajole, manipulate, and pull somewhat less than ethical (illegal?) shenanigans to get the guy they want on their team. When they know which guy it is! For the young, impressionable players – it’s not quite so easy.